Springs coming and for me that means that it's time to start sprucing up around the house. One thing that had been on my to-do list for some time was to create a nice big hand made address plaque. 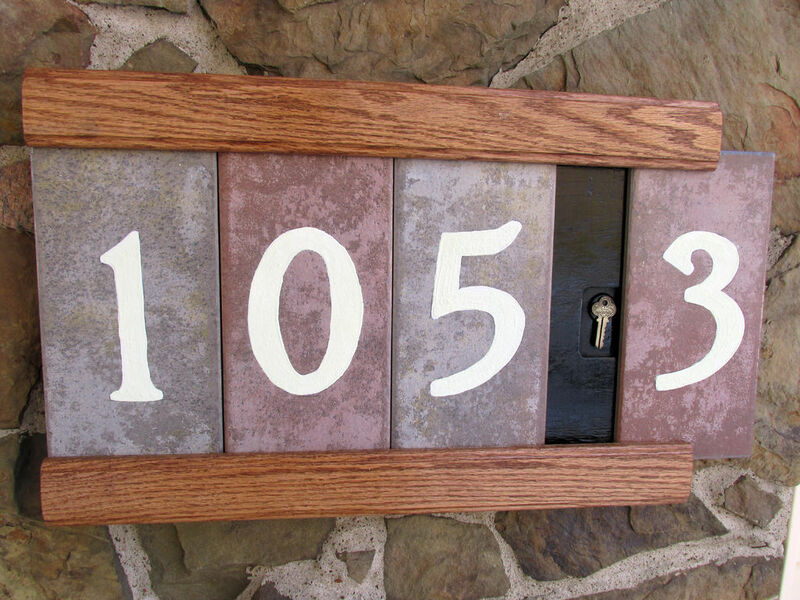 Prior to this project I had the standard black plastic numbers nailed to a post on my front patio serving as my address plaque, and although they served the purpose, they were very hard to see from the road and really didn't look all that appealing. To solve these problems I crafted a custom address plaque using tiles that I had left over from re-tiling the kitchen and some scrap hardwood that I had left over from a previous project. Of course making a simple address plaque wasn't interesting enough so I also made the numbers glow in the dark and added a secret compartment concealing a spare house key. One of the best things about this project is that it doesn't take a lot of materials, In fact, I had everything I needed for this project laying around my workshop. If you were to start this project from scratch (i.e. no materials) you could expect everything you need to cost right around 30 dollars. Check out the list of materials below to find what materials you will need. Hard Wood Boards - The boards that hold the tiles in place are oak and measure 16" long by 3" wide by 3/4" thick. The dimensions of the boards you use depend entirely on the dimensions of the tiles you choose to use. 1/2" Plywood - This is the back board that everything is mounted onto. Again the size of this board is entirely based on the size of the tiles you choose to use. Wood Stain - For this project I used Cabot Oil Based Stain in Walnut. This is one of my favorite stains as it looks good on just about any type of wood and is extremely easy to apply. Polyurethane - Polyurethane is my go to top coat, it's easy to apply and easy to repair which makes it perfect for outdoor projects like this one. Acrylic Paint - Used to create the numbers. I used plain only acrylic paint however there is special "outdoor acrylic paint", honestly save your money and buy normal acrylic and then finish it off with a few layers of polyurethane to make it "outdoor proof". Glow Powder - Glow Powder is used to make the numbers glow in the dark. after painting the numbers and before the paint has dried the powder is sprinkled onto the numbers. for more information on this process check out step 10. Assorted Screws - Used for joining the wooden pieces that hold the tiles in place to the plywood backer board. Adhesive Velcro - Used to hold the key in place in the secret compartment. Picture Hanging Hardware - What you use to mount the address plaque will largely depend on how you choose to mount it. For my sign I chose to use high strength picture hanging wire as I wanted something that would be strong enough to support the weight of the sign. Step one of this build is to create the plywood backer board that supports the various parts of the sign. this board is made from 1/2" plywood and will vary in size depending on the size of tiles that you have available. The backer board should be the same width as the combined widths of your tiles i.e. if you have four tiles and each tile is 4" wide then your backer board should be 16" wide. As for the height, the backer board should be equal to the height of your tiles plus 1.5" for the top and 1.5" for the bottom. With the backer board complete, the next step is to create the rabbeted boards for the top and bottom of the sign that hold the tiles in place. 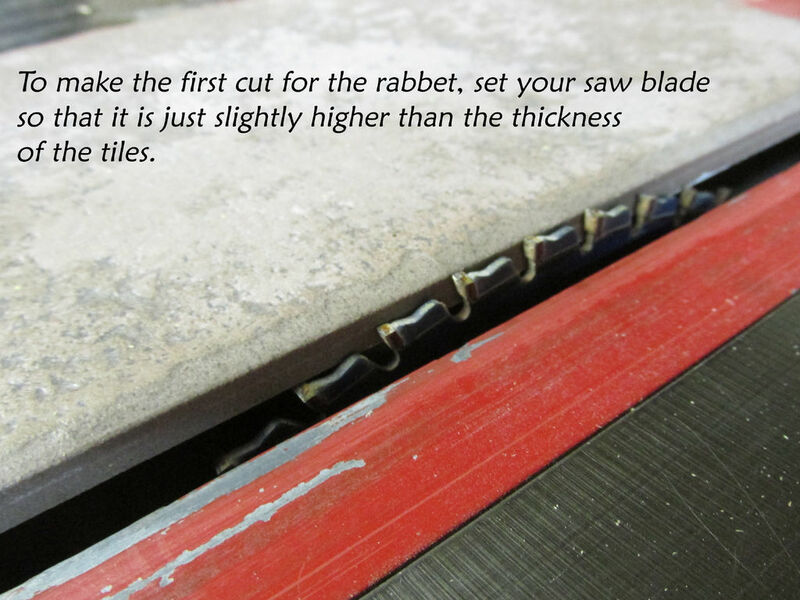 Tip: Rabbeting refers to cutting a step into the edge of a board. Generally rabbeting is used for creating wood working joinery but for this project it will be used to hold the tiles in place. Start by cutting your hard wood boards so that they are equal in length to the plywood backer board and so that they are about 3 inches wide. Next, Set your saw blade height so that it is just slightly higher than the thickness of the tiles and set your rip fence about 1" away from the blade. When everything is set properly pass your boards over the blade as shown in the picture. This cut will create the back of the rabbet. After making the first cut on both boards, raise your saw blade height to about 1" and move your rip fence in so that this cut will meet up with the first cut you made, (see picture). Once everything is set correctly make the cuts to complete the rabbets. Once you've finished the rabbet cuts in the two boards, the next step is to route the edges of those boards. Of course routing is optional, but I think it gives the sign a more polished look. For this project I used a 3/16 Ogee Fillet Bit, although a simple bead, cove, or chamfer bit would work equally well. Check out the pictures to see what the boards looked like after they had been routed. The secret compartment is hidden behind the last tile of the sign, so for my address (1053), the key is hidden behind what will become the "3" tile. To create the cavity for the key I used a plunge router equipped with a plunge cutting bit set to a depth of 1/4. It's important that you make the cavity deeper than the thickness of the key you wish to conceal because you will be mounting the key in place with adhesive velcro and the thickness of the velcro plus the thick of the key can be pretty thick, generally right around 1/4"
When it comes to wooden projects that will be exposed to the elements, finishing is always a big consideration. Gnerally when I make something out of wood I assembly it first and then finish the whole project, but for out door projects I reverse the process, finishing each piece individually and then assembling. The reason for this is that water can work it's way into small cracks and joints and if there is no finish in those places the water can cause the wood to warp and decay. For this finsih I used cabot oil based wood stain followed up by 3 coats of polyurethane for the rabbeted wooden pieces and, black exterior paint followed up by 3 coats of polyurethane for the plywood backer board. With all of the pieces finished and dry you are now ready to assemble the wooden parts of the sign. Assembly is pretty straight forward and the only big thing you need to consider is keeping the spacing correct between the two rabbeted boards so that the tiles fit into place properly. To do this, start by screwing one of the rabbeted boards in place at either the top or bottom of the plywood backer board as shown in the pictures. Next insert the tiles into the rabbet space so they fit snuggly and place the opposite rabbeted board in place and screw down. Remember you want a little "wiggle room" so the tiles can be removed when you need to retreve your hidden key. Remove your tiles after you have screwed the rabbeted boards to the plywood backer board and place them on a protected surface to paint. 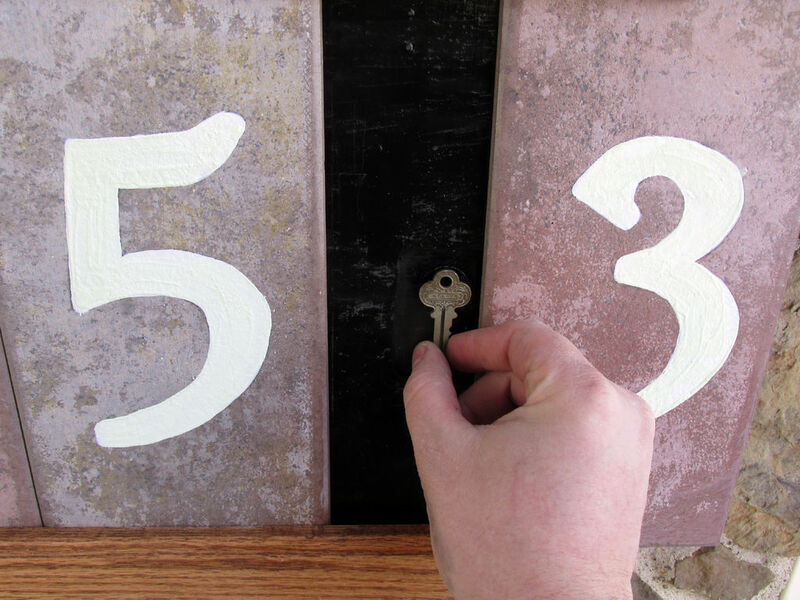 You may choose to free hand your numbers onto the tile, or use printed number templates from the computer. Note** Remember when placing the numbers on the tile you may want to measure in from each edge of the tile to ensure that the numbers are centered correctly. Once you have traced the numbers it is time to paint. The color of paint you decide to use is very important, remember that we are going to be adding glow powder over top of the numbers in the next step so that they glow in the dark. Dark colors like black blue and purple tend to diminish the brightness of the glow powder while colors like white, light green, and yellow enhance the glow powders brightness. Paint each number using regular acrylic paint. You will need to apply several coats of to get good coverage, depending upon the thickness of your paint. After applying the last coat of white paint, quickly (before the paint begins to dry) sprinkle the glow powder over the number. 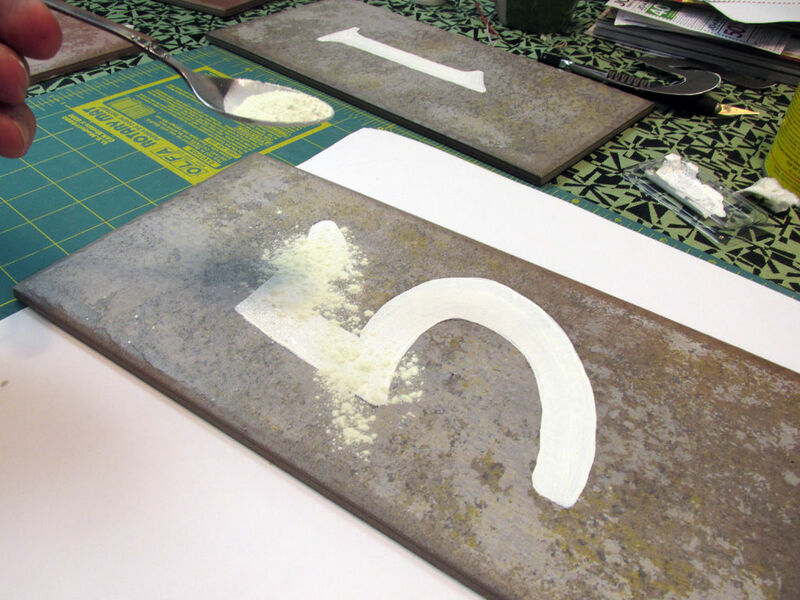 Making sure to cover the entire number and then gently bump off the excess powder onto a clean paper so that it can be collected and used again. Do each tile the same way, and set aside to dry. 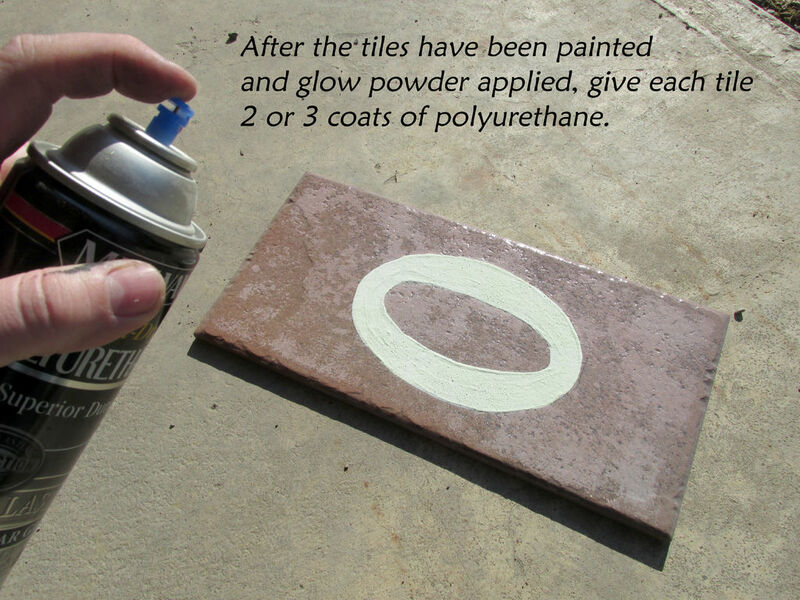 After the numbers on the tile are dry, apply 2-3 coats of polyurethane to protect the tiles from the elements. See photos for additional information. Place a piece of sticky backed Velcro in the hide a key compartment, and the opposite side onto your key then press in place. This will securely hold your key in the routed compartment. Then simply slide your finished tiles into place. There are many ways to hang your new sign, I simply used high strength picture wire wrapped between two screws that were installed into the back side of the backer board. This method will provide a great deal of strength and support so there should be no worry of the sign crashing to the ground. Step 13: The Finished Product! Here is the finished address plaque hanging on the outside of the house! I have to say that it looks a lot better than the previous black plastic numbers. The large numbers make it much easier to read from the road and not only is it visible during the day the glow powder makes it clearly visible at night as well! And if I should ever find myself locked out of the house, I now have an inconspicuously hidden spare key! I hope you enjoyed this project and found the informative presented here to be informative and useful. If you have any questions or comments please feel free to post them in the comments section and I will do my best to get back to you as soon as possible. EL might look nice here. That secret compartment is a GENIUS idea! Very nice! I like your design. I may make on similar to your's but I plan to use a stencil and spray paint my numbers and then spray paint some glow in the dark paint over my numbers too. Thanks for your great idea! very nice. you really love your house. Nice sign, but not so clever to tell the world where your key is (or even the fact that there IS a hidden key somewhere). I can almost guarantee that your insurance company will reject to pay a single dollar, if your house gets burglard without a sign of forced entry. I like everything about this project. Thanks for sharing. Hi, great project and excellent instructable. I was wondering what font did you use for the numbers? Also, I went to buy some glow powder and they said if it was under a street light then the numbers would not glow brighter than the existing lighting. Which is true in my case. I like the idea of using the tiles, I have a few lying around that will be perfect. Thanks again. The font I used was DellaRobbia BT. Your correct that the glow of a street light would cancel out the glow of the glow powder, where I live it gets pitch black at night so I can see the glow of the numbers clearly but if you have a lot of ambient light then it probably won't work so well. Thanks for the detailed sharing. Q: What is glow powder and where to buy it? DITTO to NoobOfAllNoobs question. I thought all 'Glow' type products were illegal due to Radium content, or am I being a Dinosaur? I think you're thinking of Tritium based glow products, the glow powder I use is Strontium Aluminate and is widely available (and legal). Hope that helps! Glow Powder is technically Strontium Aluminate and you can purchase it from a variety of retailers on Ebay and Amazon in a wide range of amounts and colors. Glow Powder is often used as an addative in paints, ceramic glazes and even silk screen printing inks. I have a plaque with my house numbers screwed to my siding. I was wondering if I could just paint the numbers and then add the glow powder? Thanks. That's a great question, the length of glow and brightness of glow depend on the type and quality of glow powder you purchase. I used a green powder which tends to be the brightest and longest glowing, (it'll glow bright for about an hour and then become dimmer over the next 2 or 3 hours until it barely glows at all). You can purchase other colors of powders and even glow paints that already have the glow medium mixed into them. I love to see people doing cool stuff with house numbers. They're one of those small details that make your house stand out from the others, and are so easy to do something awesome with. Nice work! I love it. You might see an "I Made It!" from me before too long! Awesome 'ible! Definitely want to try this. Something that came to mind though was - if the plaque happened to get bumped and tilted slightly, could the tiles slide out (and subsequently break)? Or is the design/dimensions such that it wouldn't really happen easily and therefore some type of end cap/tab wouldn't be necessary?